I can’t properly state how thrilled we were today. Not only did we see some of the most magnificent architecture of my life, but we spent the whole day with John Hardy to get the first-person perspective on how it comes together. The first stop was the “factory.” In one building, you can see the design team create models of the homes they intend to build, with the iterations hanging upside down from the ceiling. 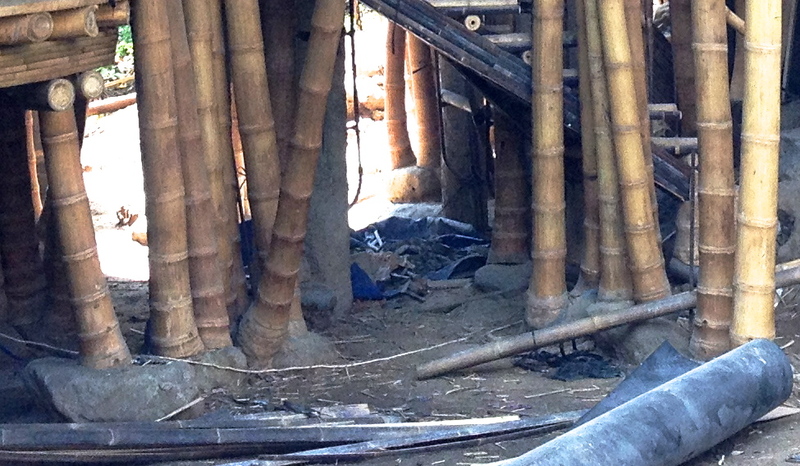 Outside is a bamboo processing operation, where the massive 40′ trunks are treated with Borax, pressure washed and stacked for sale or use in their own projects. 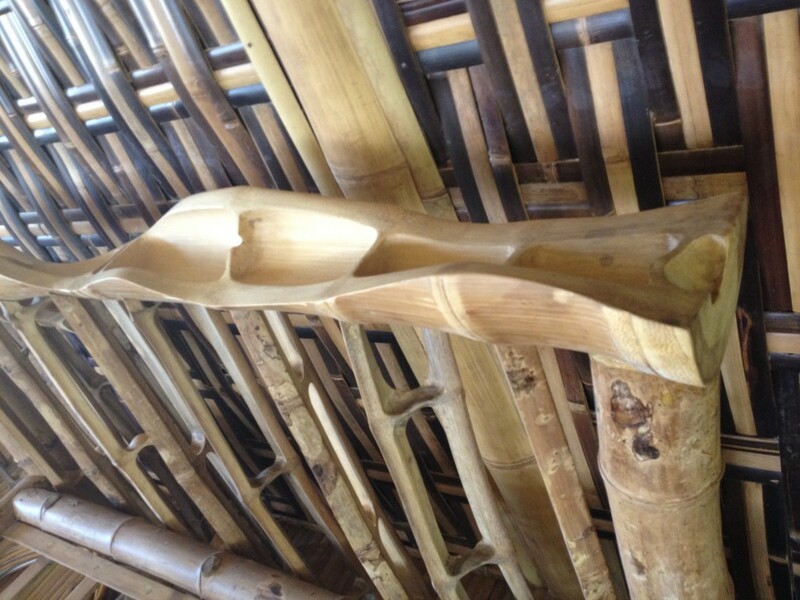 Many different types of bamboo come into the facility, each with its own use: the straight ones become structural components for buildings, while the curvy ones make great railings or furniture elements. Some pieces are ripped into small strips so they can be reassembled into flooring or counters. Some larger pieces are scored so they can become matts. Then there are the beautiful cross-sections which make up headboards or railing posts. Interspersed with this variety of operations is a small clue into John’s creative thinking. 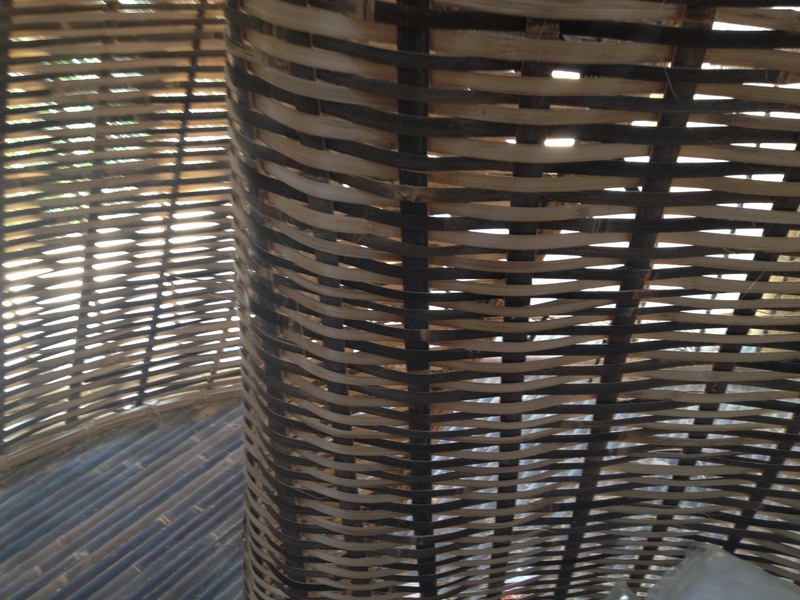 In almost every corner there is an experiment: combining bamboo with tires, ceramics, or glass and with other bamboo components in a variety of constructions. Each one looked like a whole new business was ready to start. 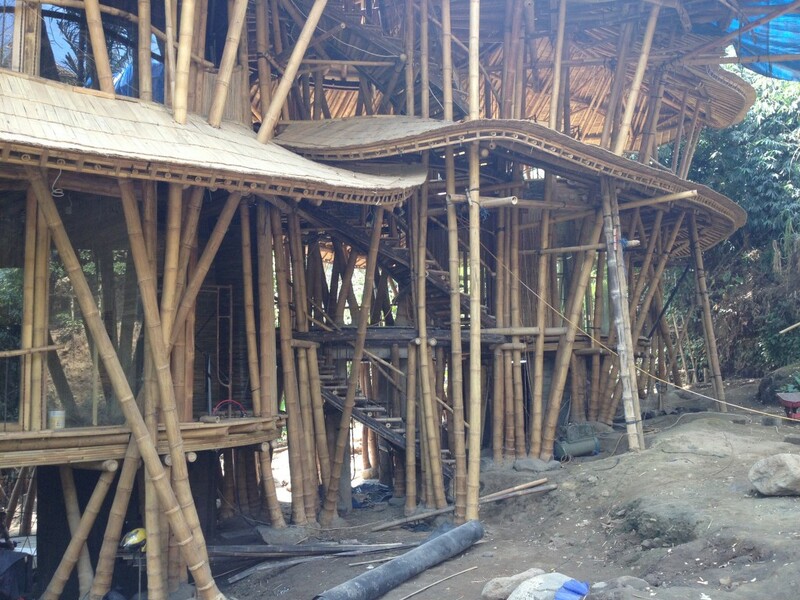 Our first stop was to look at a bamboo home in process. The entry was through a fully round tunnel – apparently the concept came from laying a tower down. The workers made it look like it was a fine idea. In Bali the climate is quite friendly: temperature is moderate, bugs are nothing like NC, and the rain falls vertically. So this means walls are optional. For the most part, the Hardy’s opted out. Of course some spaces require some privacy, so bathrooms were created as large baskets deployed in corners of the open spaces. The undulating walls created some layers of separation and in some cases obviated the need for doors. When doors and windows were needed, they found appropriately creative ways to address them. Countertops, floors, railings were all part of the vision. 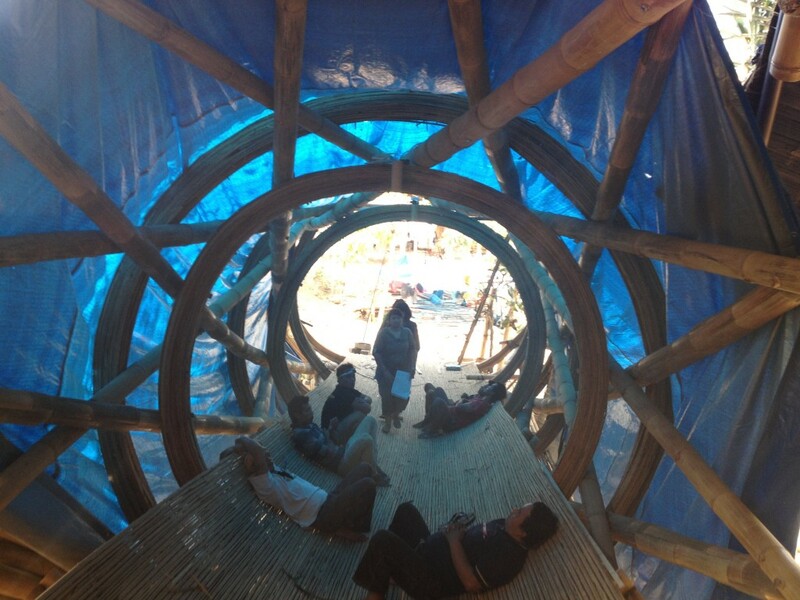 It was stunning to see how the designs worked with the existing topography and barely disturbed it in construction. Clearing an architectural site is always a highly disruptive activity that consumes massive amounts of energy, destroys lots of foliage, and creates runoff problems. But in many ways it all clicked when I saw the footings. Generally a footing needs to be purely compression-bearing. Shear forces at the base is an engineering no-no, especially without tensile structures in place. So columns are always built straight up. However the Hardy’s have come up with an ingenious footing system that allows their main columns so meet the ground at an angle. I won’t give away their system, but as an engineer, I see this footing system as a “secret sauce” (I think they have many). Once liberated of that, the design opportunities opened up exponentially. But it’s not like it happened by accident. In my experience the best creativity emerges when new constraints are imposed. 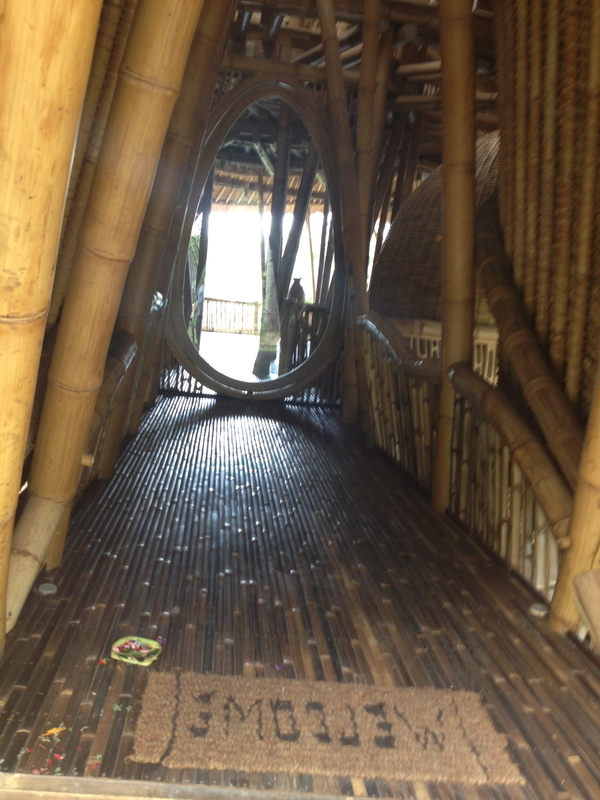 The Hardy’s committed to sustainable design and bamboo. This then pushed them into finding ways to design and work with the material, which led to a nice innovation in footings and freed them of perpendicular architecture. This in turn opened up an ocean of new design possibilities. 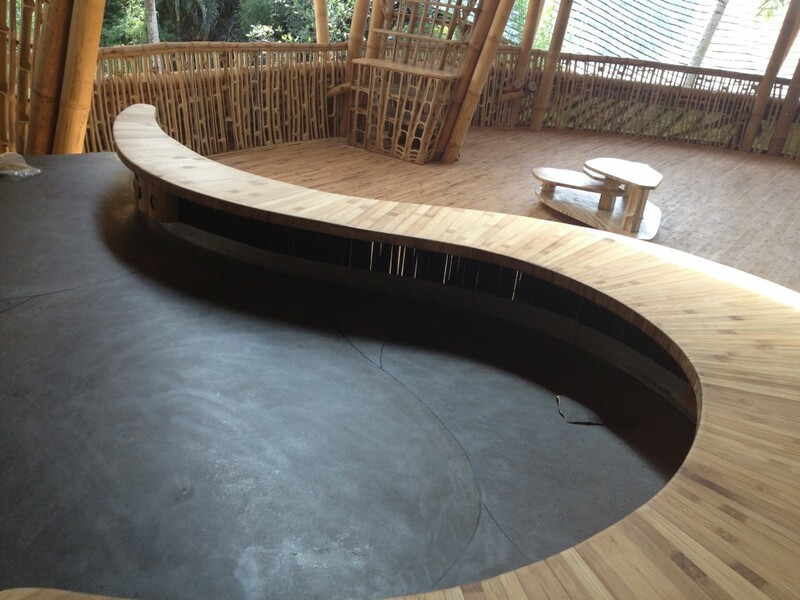 What sells anyone on their bamboo system is not the sustainability, but the fantastic designs that emerge because of this commitment. Sustainability is clearly in the DNA of these buildings, and this manifested into some gorgeous forms. See Beth’s post with way better pics here. 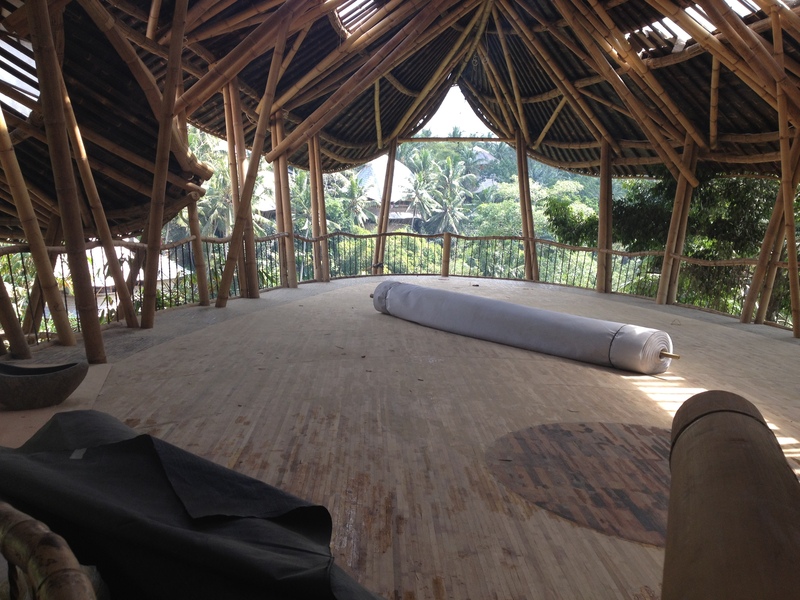 This entry was posted in Eisenhower, Indonesia, Sustainability and tagged Bali, bamboo, basket, columns, design, Elora Hardy, engineering, John Hardy, Ubud on July 11, 2012 by aly.